The U.S. Justice Department has approved the proposed $67 billion merger between health insurer Cigna Corp. and pharmacy benefit manager Express Scripts, the companies announced Monday. Cigna and Express Scripts still must secure certain state regulatory approvals to complete the deal, which was first announced in March, but the nod from the federal antitrust enforcers takes care of the biggest hurdle. The companies expect to close the deal by year-end. "We are pleased that the Department of Justice has cleared our transaction and that we are another step closer to completing our merger and delivering greater affordability, choice and predictability to our customers and clients as a combined company," Cigna President and CEO David Cordani said in a statement. "The value that we deliver together will help put our society on a far more sustainable path—one that helps healthcare professionals close gaps in care and supports our customers along their health journey." Assistant Attorney General Makan Delrahim who leads the Justice Department's antitrust division said the regulators' six-month investigation into the deal concluded it is "unlikely to result in harm to competition or consumers." In particular, the agency said the merger would not lessen competition in the sale of PBM services because Cigna's in-house PBM business is small and at least two other large PBMs and several smaller ones remain in the market. The agency also said competition from other vertically-integrated companies and PBMs and the prospect of losing customers makes it unlikely that Cigna and Express Scripts would hike prices for their rivals after merging. Cigna and Express Scripts said 16 states have approved the merger already. Nine more must sign off before they can close the deal, according to a Cigna spokeswoman. Officials at Bloomfield, Conn.-based Cigna and St. Louis-based Express Scripts have said their merger would drive higher quality care and affordability by offering insurance and pharmacy services under one roof. The majority of the cost savings that result from the tie-up will flow to customers and not shareholders, Cordani has said. In the news announcement Monday, Express Scripts CEO Tim Wentworth reiterated that combination of the companies would "be able to do even more to reduce healthcare costs, expand choice, and improve patient outcomes" and "transform healthcare." But many observers, including hospital groups, employers and other health plans, have criticized the deal and that of CVS Health and insurer Aetna's, which has not yet been cleared by the Justice Department, as profit-driven schemes unlikely to benefit consumers. In August, billionaire investor Carl Icahn slammed the deal, arguing that Cigna was "dramatically overpaying" for the nation's largest PBM at a time when such middlemen were facing mounting government scrutiny for their role in rising drug prices. But Icahn abandoned his efforts to derail the merger after two independent advisory firms recommended shareholders approve it. 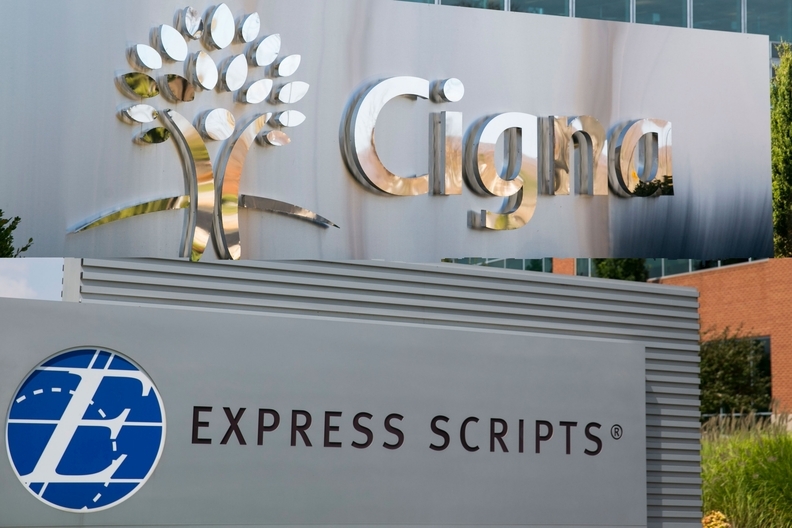 Cigna and Express Scripts' investors approved the deal in late August. The Justice Department's approval of the Cigna-Express Scripts deal did not come as a shock. The deal is described as a "vertical merger," meaning it involves companies at different points in the supply chain that do not directly compete for customers. Federal antitrust enforcers have not successfully blocked a vertical merger in decades, and a federal judge in June cleared the vertical deal between Time Warner and AT&T after the Justice Department challenged it, which boded well for Cigna and Express Scripts' chances. Cigna previously attempted to merge with rival insurer Anthem, but the Justice Department challenged the $54 billion deal for threatening to harm competition for the administrative services business of large employers. A federal judge blocked that deal in February 2017. Cigna and Anthem are still battling over a $1.85 billion break-up fee. Express Scripts is also involved in a legal spat with Anthem, which sued the PBM for $15 billion after alleging it overcharged Anthem by $3 billion annually. Express Scripts countersued the insurer, which represents about a fifth of its revenue. After its relationship with Anthem soured, Cigna wasted no time looking for another partner. Cigna pursued Express Script with the idea that the two could further Cigna's goals of value-based care delivery by managing the medical, pharmacy and behavioral aspects of healthcare holistically. Its board of directors also saw the need for Cigna to rein in pharmacy spending, one of its main drivers of healthcare costs, according to SEC documents from May. Express Scripts at the time was concerned about continuing as a standalone PBM when so many competitors were consolidating and new entrants like Amazon were rumored to be scoping out the healthcare market. Express Scripts' stock price rose almost 4% and Cigna's rose 1.4% in the wake of the Justice Department's approval.